The aurora borealis has been casting its spell over the peoples of the North for centuries. The Vikings believed that the mysterious glow emanated from the shields of the Valkyries, the mythical maidens who carried fallen warriors to Valhalla. Many Inuit communities thought that the aurora was caused by the spirits of the dead, playing a football-like game with the skull of a walrus! The science behind the aurora is complicated, and the intensity of the lights is linked to solar activity. When solar flares erupt from the sun, the Earth is bombarded with electrons and protons. Most of these particles are deflected by the Earth’s magnetic field, but some make it into the upper atmosphere and react with oxygen and nitrogen molecules, giving off the photons that create the phenomenon we see as the Northern Lights. The colours of the aurora vary from a greenish-yellow curtain to a multi-coloured display that fills the whole sky, depending on which gas is reacting with the solar particles and the altitude at which it’s happening. The higher up in the atmosphere that the reaction takes place, the redder the lights. The area in which the Northern Lights are visible at any given time is known as the auroral oval, and this fluctuates depending on geomagnetic and solar activity. For the best chance of seeing the aurora you need to be as far as possible from any sources of artificial light, so most Northern Lights tours will take you away from the city and into the countryside. From the UK, the most accessible destinations with a good chance of seeing the lights are in Northern Europe. The Norwegian city of Tromsø is a popular gateway for aurora hunting expeditions, and from here you can venture along the coast to the North Cape, or south to the stunning Lofoten Islands. A trip to Swedish Lapland allows you to incorporate the famous Icehotel into your tour, while neighbouring Finland offers cosy log cabins, invigorating saunas and the chance to visit Father Christmas! Iceland is another popular Northern Lights destination, and a short break in Reykjavik or the surrounding countryside can offer a cheaper alternative to Scandinavia. Further afield you can see the lights in Alaska, Greenland or northern Canada, where you can combine an aurora tour with a polar bear safari in Churchill. What is the best time of year to see the Northern Lights? You need dark skies and clear weather to see the Northern Lights, so the winter months are best. Hours of darkness are longest between December and February, allowing more time to spot the lights, but it’s worth bearing in mind that it can be extremely cold in the Arctic at this time of year. In September and October the lakes and rivers of Scandinavia are still ice-free, so you have the prospect of seeing the lights reflected in the water, which makes for some stunning photos. The optimum time to see the Northern Lights is generally between 9pm and 1am, and if possible it’s better to avoid a full moon, as the moonlight can reduce the intensity of the display. It’s notoriously difficult to predict exactly when the lights will appear, but you can check the NOAA's Ovation maps for a detailed daily aurora forecast. What should I pack for a Northern Lights tour? Make sure you pack warm and well-insulated clothing - layers are key! A thermal base layer, parka, thick socks, hat, gloves and walking boots or snow boots will all help to keep you warm. Waterproof clothing is also recommended, particularly in Iceland, though it’s not quite as essential in Lapland where the weather tends to be cold but dry. A balaclava will protect your face from wind chill if you’re husky sledding or snowmobiling, and sunglasses or goggles are worth considering. Lip balm and moisturiser will also come in handy in cold temperatures. If you’re heading out into the wilderness then a red light torch is a good idea, as it won’t affect your night vision when you’re trying to spot the Northern Lights. And, of course, don’t forget your camera! It’s possible to capture the Northern Lights with a compact camera or even a smartphone, but for those really stunning shots you’ll need a digital SLR. If you’ve spent your life shooting on ‘auto’ mode then now’s the time to bite the bullet and learn what all those settings mean! As you’ll be shooting in low light you’ll need to use a high ISO (generally 800-1600 ISO unless you’re using a very fast lens), and you’ll want as wide an aperture as possible to let in more light. A minimum aperture of f3.5 will work but f2.8 or faster is recommended by the pros. A stable tripod is an absolute must, as you’ll need to use a slow exposure to capture the lights. A wireless remote will also help with this, allowing you to take a photo without disturbing the camera and blurring the image. Very cold weather can significantly impact on battery life, so make sure you bring spares, and invest in a high quality memory card that won’t be slowed down by the cold. Most importantly of all, don’t spend so much time fiddling around with your camera that you forget to appreciate the incredible spectacle in front of your eyes! What else can you do on a Northern Lights holiday? Although the aurora is the star attraction, there are all sorts of other winter activities to enjoy on a Northern Lights holiday. Active pursuits include husky sledding, snowshoeing, snowmobiling, cross country skiing, cycling and horse riding. Alternatively you can chill out in a hot tub, enjoy an exhilarating sauna, or head out on a whale watching cruise. Depending on where you are, you might see wildlife including moose, caribou, reindeer and polar bears. There is also some wonderfully unique accommodation on offer, including hotels fashioned from ice, rustic log cabins and glass igloos where you can enjoy the aurora from the comfort of your own bed. Who are the best Northern Lights tour operators? You’ll find a wide range of Northern Lights holidays on the TourHound website, covering a broad mix of destinations and tour styles. Exodus specialise in active adventures such as snowshoeing in Finland, walking tours of Greenland and tours of Arctic Sweden that include an unforgettable night in the Icehotel. Explore! 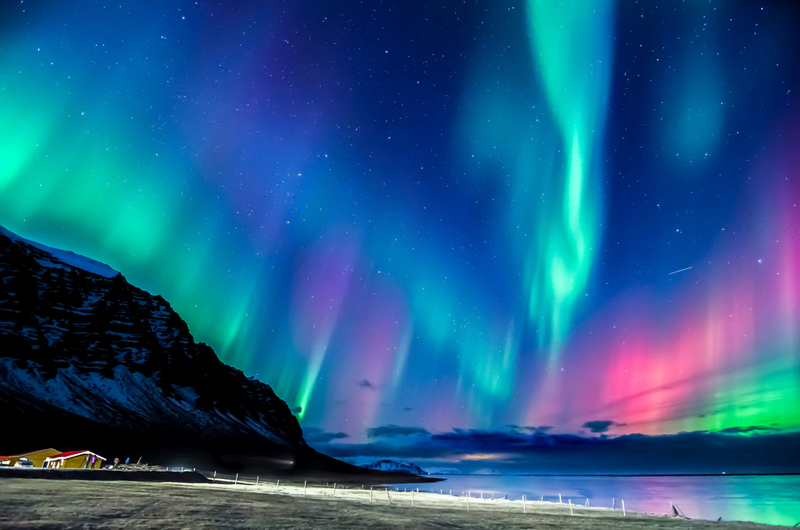 offer the chance to hunt the Northern Lights in Iceland with an expert astronomer, while Just You specialise in tours for solo travellers to destinations including Iceland and Norway. Contiki and Intrepid cater to a younger crowd, and their fast-paced tours provide a more affordable way to see the Northern Lights. You can even get to the Arctic Circle without flying on one of Leger Holidays’ UK coach departures, which will take you via Belgium, Germany, Denmark, Sweden and Finland, all the way to the northern tip of Norway and back. There really is so much choice, and the best way to find the perfect Northern Lights tour for you is with TourHound’s innovative tour comparison tool. It’s so easy to use - simply Search, Compare, Select.